Le Cordon Bleu Paris trained Pastry Chef. I write, I bake, I eat! I’m a foodie! Valentine’s Day is just around the corner! What are your plans- fancy big dinner or staying in with a home cooked meal? We’re staying in this year and celebrating with this simple chocolate cake. It’s a quick 1 bowl dessert, no mess, no fuss and sugar free as it’s sweetened with maple syrup. I hope you enjoy it and let me know how it turns out. Would love to hear your plans, leave me a note in the comments! • Whip the butter, add the eggs until double in volume. • Add the maple syrup, fleur de sel and vanilla bean. • Gently fold in the flour, baking powder, and cocoa powder until combined. • With the mixer running on the lowest speed, slowly pour in the espresso. Can also be done by hand – gently fold in the espresso with a whisk until smooth. • Pour into a 9″ baking pan with a removable bottom and bake for 15-20 minutes. • Remove and let cool. • Serve with whipped cream, dust with icing sugar or dust with dehydrated crushed raspberries as shown in the photo. Happy December! We’re in the last days of the year and unveiling our final PC Black Label Collection box. Let’s take a closer look at these wonderful products and what we will be using to make our holiday recipe this month! 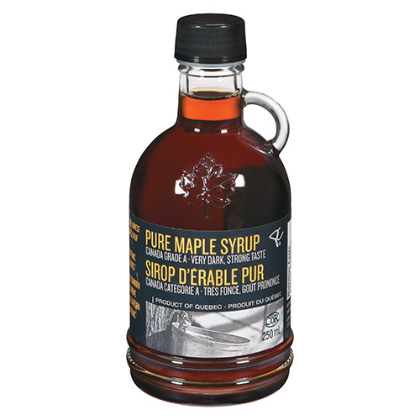 100% pure and crafted in the Beauce-Frontenac region of Quebec, this lusciously sweet Pure Maple Syrup is harvested late in the season for a heightened and deeply rich maple flavour and naturally dark colour. 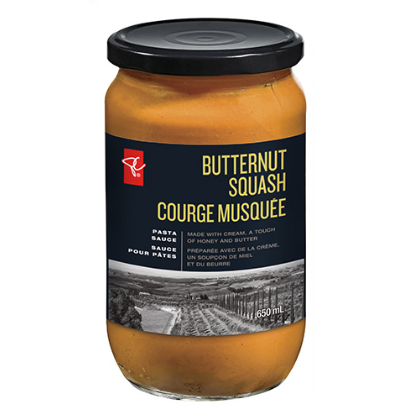 Imported from Italy where it’s prepared in small batches, this delicious Butternut Squash pasta sauce is excellent with pasta, chicken, roasted vegetables and as a sauce for pizza. 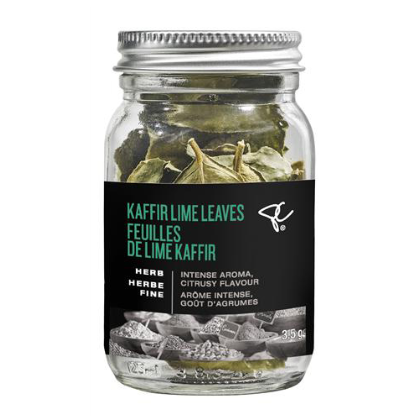 Imported from Thailand, these Kaffir Lime Leaves impart a fragrant, citrus bouquet to your Thai, Malaysian and Indonesian curries, stir-fries and soups. I opted to go with the PC Black Label Pure Maple Syrup this month to make Maple Mousse Verrine cups. Perfect for the holiday season and easy entertaining, they’re decadent and delicious and will have your guests asking for seconds! Simple ingredients bring this beautiful dessert together in no time and can be prepared ahead of time without the fuss! This PC Black Label Pure Maple Syrup is rich and decadent and we’ve been enjoying it in these Maple Mousse Verrines as well as on pancakes, waffles, oatmeal (yum!) ice cream and even in my morning coffee. I hope you’ll try out my new recipe this month and let me know what you think in the comments section below or on my social media channels using my hashtag #hautesucre. Whether you’re a home chef or an aspiring foodie, the PC Black Label Collection makes it easy to unleash your culinary curiosity and get creative. Discover the entire collection and be inspired to #PlayWithYourFood at pc.ca/blacklabel. 1. In a large stand mixer fitted with the whisk attachment, whisk the chilled whipping cream on medium high until soft peaks form. 2. Add the raw sugar and cream cheese and whisk on highest setting for 2 minutes until the mixture is smooth. 3. Add the salt, vanilla bean, maple syrup and a 1/4 cup of the maple Hazelnut crunch. Whisk on high for 2 minutes. 4. Transfer the mixture to a piping bag fitted with a mid size nozzle. 5. Pipe the mixture into 4-6 small glass cups (approx 125ml) leaving 2 inch from the top. 6. Refrigerate the Maple Mousse Verrines until well chilled, approx 1-2 hours. 7. Garnish with the remaining Maple Hazelnut Crunch pieces just before serving. Enjoy! 1. Over high heat bring a small pot of maple syrup to a boil. 2. Once it starts to bubble and foam, add the hazelnuts and stir for 1 minute. 3. Once the mixture coats the back of a spoon, pour it on a parchment lined sheet and spread out (approx 3-5 minutes on medium-high heat). 4. Allow it to cool completely and crack into small pieces with your hand or with the back of a large spoon. (This post is sponsored by President’s Choice. I used their PC Black Label Pure Maple Syrup to make these decadent Maple Mousse Verrines). We’re back with another exciting month of delicious President’s Choice PC Black Label Collection products. Let’s take a closer look at this month’s box. 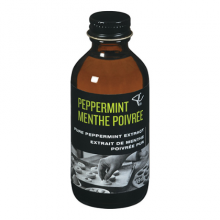 A must-have during the holiday season and colder weather months, add a drop or two of this refreshing pure peppermint extract to hot chocolate, cappuccino, cookies, candies, icings, and sweetened whipped cream. It’s also great massaged onto your temples to relieve a headache! 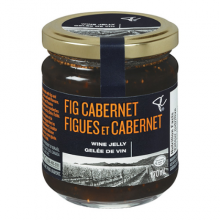 This sweet wine jelly is infused with ripe, sweet figs and dry, full-bodied Cabernet Sauvignon, a red wine with rich black currant and dark cherry notes. It’s the perfect pairing this holiday season, whether it’s a part of an appetizer cheese tray or brushed onto a plum or pear tart for dessert. Known for its superior quality, the Madagascar-Bourbon vanilla bean is the most popular of all the vanilla varieties. 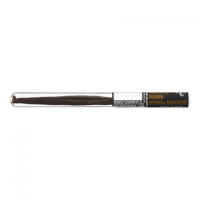 It is highly fragrant, with desirable thin, oil-rich skin, and has sweet, smooth flavours and aromas. I have had a chance to try these products in various recipes and I must say that my favourite item this month has been the PC Black Label Madagascar Bourbon Vanilla Bean. As a Pastry Chef, this is a highly coveted item that I love to work with and always reach for before using any extracts. The flavour is rich and shines in any sweet or savory dish that it is used in. For this month, I decided to showcase my love for cranberries and vanilla bean in the form of scones. 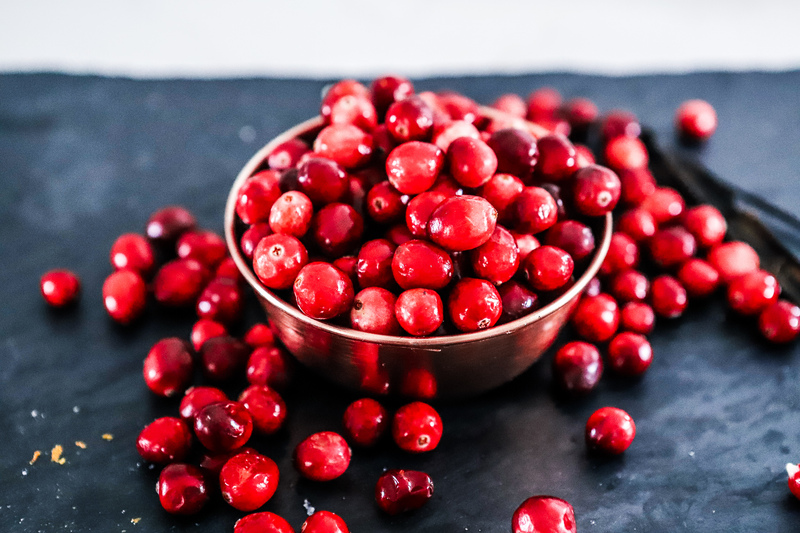 I love this time of year with the fresh cranberries and the holiday season fast approaching, these are perfect to make for a weekend brunch. They are sure to please everyone. If you’re not a fan of cranberries, you can swap them out for blueberries or raspberries. I’m excited to be hosting a giveaway for next month’s PC Black Label Collection Black Box on my Instagram feed. Read on for more information and how to enter below. Good Luck! I hope you’ll enjoy the recipe and it becomes your favourite go-to breakfast dessert. I would love to see your recreations using the hashtag, #hautesucre on your social media channels. Whether you’re a home chef or an aspiring foodie, the PC Black Label Collection makes it easy to unleash your culinary curiosity and get creative. Discover the entire collection and be inspired to #PlayWithYourFood at pc.ca/blacklabel. The giveaway will be open for entries on Instagram from Monday November 26th, 2018 to Wednesday November 28, 2018 9:00PM EST. Please follow the instructions in the Instagram post to enter. The winner will be chosen randomly on the morning of Thursday November 29, 2018 and contacted via Instagram direct message. The giveaway is open to residents of Canada only. Preheat oven to 425°F. Line 2 large baking sheets with parchment paper and set aside. Using a sharp paring knife, slice the vanilla bean lengthwise from tip to end. Use the back of the knife to scrape out the vanilla beans. *The vanilla bean pod can be reused and added to your sugar container to make vanilla scented sugar. In a large bowl, combine 2-3/4 cups flour, vanilla bean, sugar, baking powder, baking soda, orange zest and salt. Cut in butter until mixture is crumbly and pea sized, do not overmix. Pour in the buttermilk and cranberries and stir with a fork until a soft, sticky dough forms. Turn out onto a floured surface and, with floured hands, gently knead and shape the dough, adding more flour to prevent sticking as necessary until dough comes together. Pat out to a 9-inch (23 cm) circle or square as shown and cut into 12 wedges. Place on prepared baking sheet, at least 1-inch (2.5 cm) apart. 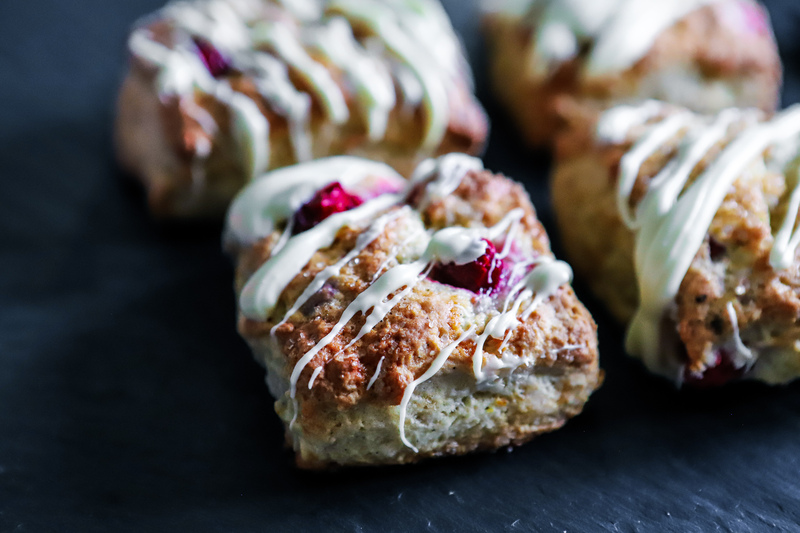 Brush tops of scones with heavy cream and sprinkle with raw sugar. Bake for 15 to 20 min, until puffed and golden. Let cool for at least 20 min on a wire rack. Melt the white chocolate in a heat proof bowl for 45-60 seconds on high in the microwave. 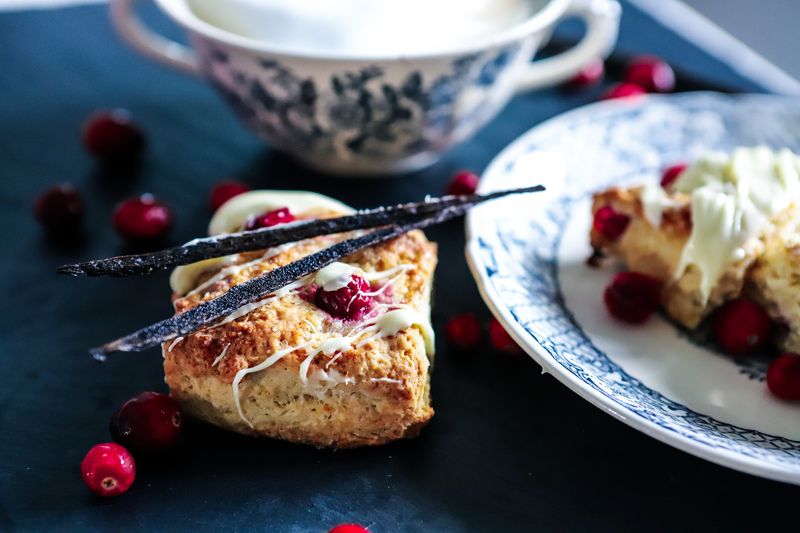 Using the tines of a fork or the back of a spoon, drizzle the white chocolate over top of the scones. Let it set for a few minutes until the chocolate sets and is no longer runny. Enjoy! (This post is sponsored by President’s Choice. 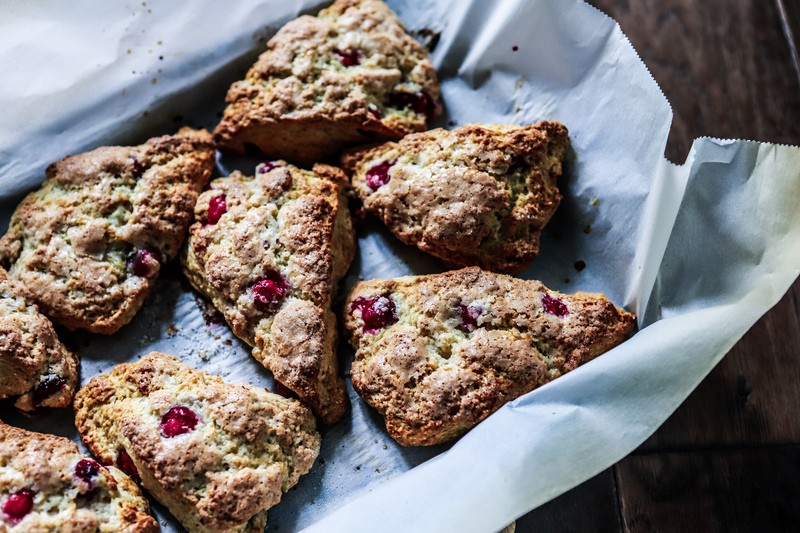 I used their to PC Black Label Madagascar Bourbon Vanilla Bean to make these scrumptious Cranberry Vanilla Bean Scones). Hi, I'm Asima! I'm a Le Cordon Bleu Paris trained Pastry Chef who loves food, baking, + travel. Here you will find sweet and savory recipes, helpful tips and lots of foodporn! Hopefully I can inspire you to cook and bake. Enjoy and thanks for stopping by! Pizza night!😋🍕🔥 What are you having?